Report on the assessment of achievement of Common Safety Targets (CSTs) / National Reference Values (NRVs) prepared for the EC following the CSM set out in Commission Decision 2009/460/EC. The Agency is pleased to announce the publication the Safety Interim Report 2017. 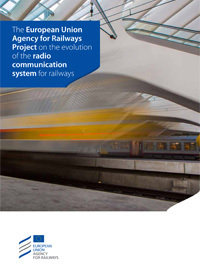 It is a shorter Version of the Railway Safety Performance report and solely published electronically. 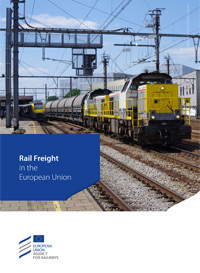 The report covers all EU Member States plus Norway and Switzerland and all significant railway accidents in these countries. The eighth report on the assessment of achievement of Common Safety Targets (CSTs) / National Reference Values (NRVs) prepared for the EC following the CSM set out in Commission Decision 2009/460/EC. The safety performance report 2016 presents common safety indicator data, overview of serious accidents in the EU, results of annual assessment of CSTs and a series of data analysis results. 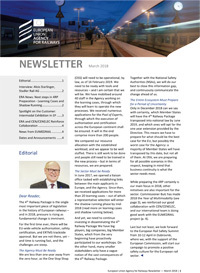 The seventh report on the assessment of achievements of Common Safety Targets (CSTs) / National Reference Values (NRVs) prepared for the EC following the CSM set out in Commission Decision 2009/460/EC. 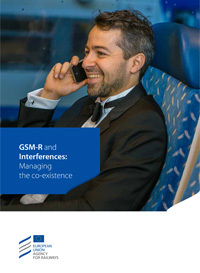 The Agency produces report on progress with interoperability every two years which provides the basis for the analysis of the trends of implementation of interoperability across the European Union. The sixth report on the assessment of achievements of Common Safety Targets (CSTs) / National Reference Values (NRVs) prepared for the EC following the CSM set out in Commission Decision 2009/460/EC. 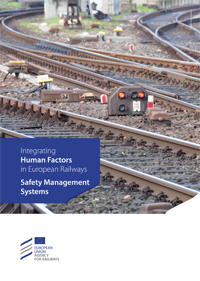 The safety performance report 2014 presents common safety indicator data, overview of serious accidents in the EU, results of annual assessment of CSTs and a series of data analysis results. The fith report on the assessment of achievements of Common Safety Targets (CSTs) / National Reference Values (NRVs) prepared for the EC following the CSM set out in Commission Decision 2009/460/EC. The fourth report on the assessment of achievements of Common Safety Targets (CSTs) / National Reference Values (NRVs) prepared for the EC following the CSM set out in Commission Decision 2009/460/EC. 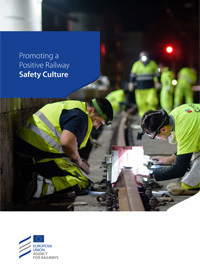 The safety performance report 2013 presents common safety indicator data, overview of serious accidents in the EU, results of annual assessment of CSTs and a series of data analysis results. 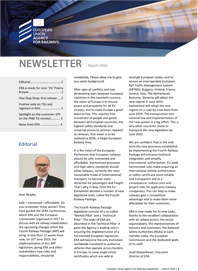 The safety performance report 2012 presents common safety indicator data, overview of serious accidents in the EU, information on safety certification, safety targets and developments in safety regulation. In all high risk industries, developing a positive safety culture has been increasingly recognised as vital to operate safely. 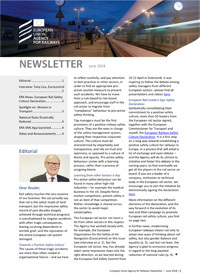 The European Railway Agency has now published leaflets on railway safety culture. 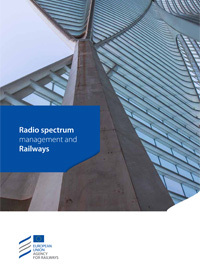 General Information on ERTMS at the Agency. 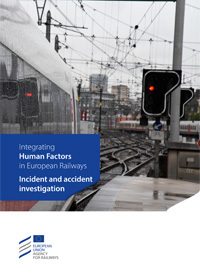 Human Factors play an increasingly important role in modern complex, safety-critical systems. 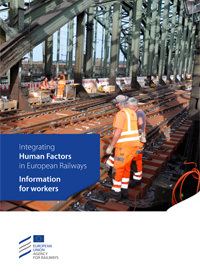 The European Railway Agency has now published leaflets on Human Factors. Safe – connected – affordable. Do you remember these words? 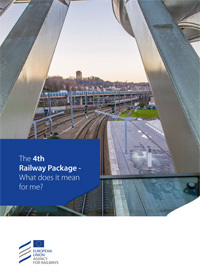 They have guided the SERA Conferences which ERA and the European Commission organised in 2017 to discuss with all railway stakeholders the upcoming changes which the Fourth Railway Package (4RP) will bring. Rail safety touches the very essence of our business. 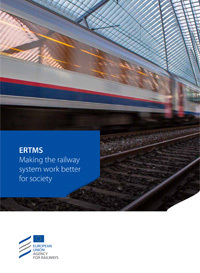 We can proudly say that rail is the safest mode of land transport, but the impressive safety record of past decades (largely achieved through technical progress) is overshadowed by singular accidents with often tragic consequences, leaving surviving dependants in terrible grief, and the reputation of the entire European rail system damaged. 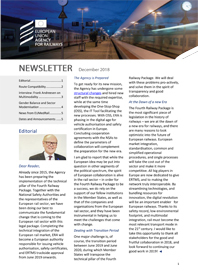 The 4th Railway Package is the single most important piece of legislation in the history of European railways – and in 2018, pressure is rising as fundamental change is imminent.For the first time ever, there will be EU-wide vehicle authorisation, safety certification, and ERTMS trackside approval. But we are not there, yet – and time is running fast, and the challenges are steep.